Will and I haven't been on a proper date in years. Seriously. The kids' grandparents all live far away, and as far as nannies go, we just haven't found the right one since moving to Kimberley. Needless to say that date night has been on our wish list for a long, long time. When we started making plans to visit my dad and step-mom on the farm this holiday, I immediately started thinking of ways to sneak in a date with Will. The kids love spending time with their grandparents, and vice versa, so this was one opportunity that we just couldn't miss. But where do you go for the perfect date in the middle of the Kalahari...? Enter International Run No. 5. 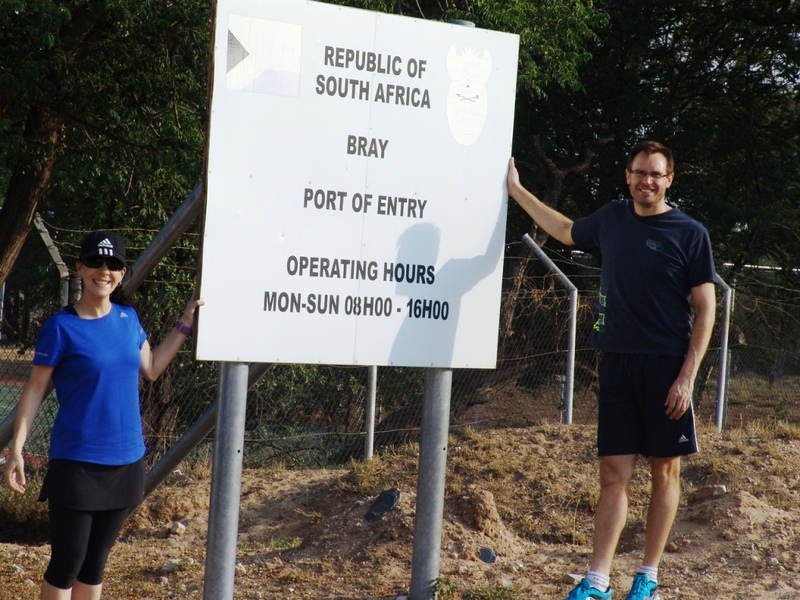 After getting into our running gear and leaving the kids with Grandpa and Grandma at 06:30 a.m. on Wednesday, Will and I set off on a date morning of note: A run on the opposite side of the S.A. border, in Botswana, about 50 km from the farm. 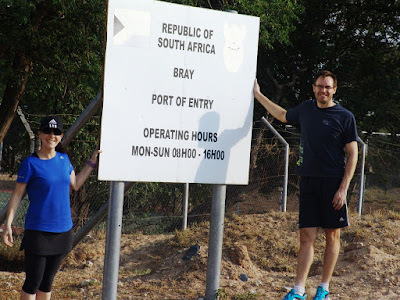 We had about 30 minutes to kill before the border post opened, and spent it taking pics (obviously) and deciding on what exactly we were going to write on our customs forms... Reason for visit: A run...? Any customs official's dream. Killing some time before the border post opened. We thankfully got through customs without too many questions and eye rolls, stopped in the shade of an old Camel Thorn tree in front of the nearest general dealer, and geared up for our run. 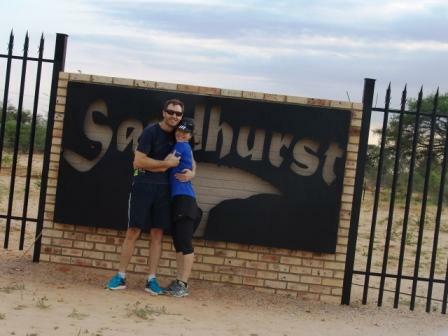 It was a tough one: With temperatures in the lower 30s at 08:00 a.m. and thick Kalahari sand beneath our feet, we managed a 32-minute 5 km on a beautiful, quiet road along the (dry) Molopo River. Village children playing on make-shift swings shouted "Hallo! Good-bye!" as we passed them, giggling uncontrollably at the sight of the two crazies trudging through the thick sand. We ended our run in the shade of that big Camel Thorn tree, which we now shared with a donkey cart and all its passengers. Some more giggling ensued as they witnessed the taking of our obligatory end-of-run pic, after which we raided the general dealer's fridge for something cold to drink. Much to our surprise, we found some glorious, ice-cold berry juice, of which we promptly downed about a litre each. Bliss! We were back in S.A. and on the farm within four hours and found J Bear fast asleep and Missy K and Grandma flat on their backs on the tile floor (the coolest place in the house), watching Cbeebies. The perfect date if ever there was one! I've also updated the Running the World page - you can view it here! Six countries down, 190 to go! You're so right! Botswana is stunningly beautiful - I'll never get enough of it! It was perfect, Tony - highly, highly recommended! That's such a cool story! Made me smile. I only ran with the small "mik en druk", but you're right, Jeanette - there were SO many lovely moments and people to capture along the way. I would have loved to see them all through your photographer's eyes and lens!